In Spring of 2017, our client selected us to design and install a landscape to complete the vision they had for their home. There were a few challenges to overcome, and we’ll discuss how we overcame them. It was important for the homeowners to complete their backyard with a dining and entertainment area. It was equally important to bring nature right into the yard and highlight it at night. They wanted to take advantage of the summer by enjoying a meal outside, going for a swim in the summer heat and roasting marshmallows while sitting around the fire. It was important to them to enjoy these moments, right in their backyard. 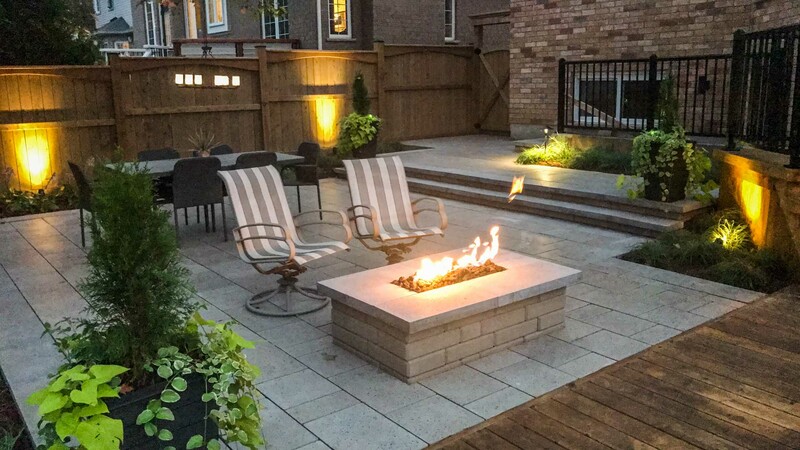 The first obstacle was that the client had a strong taste for a modern design; particularly they wanted paver slabs with grass in between them. 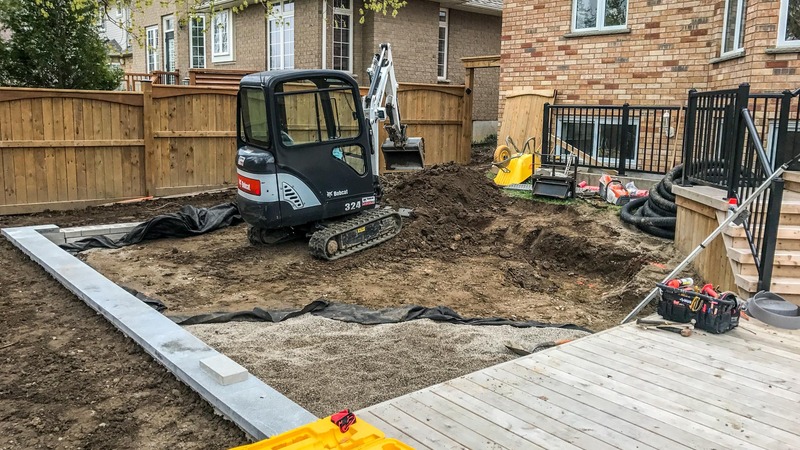 The issue with this is that they wanted low maintenance and the proposed side walkway along the house would make it difficult to maintain as they stored maintenance equipment in their garage. 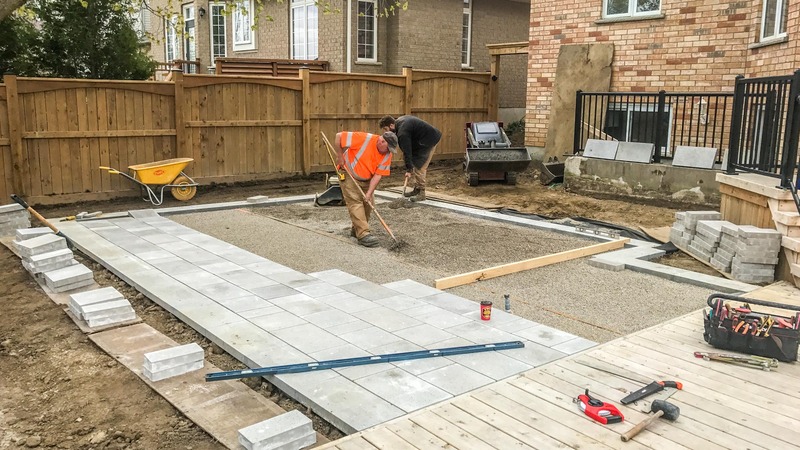 Although that english style looks nice, completing a feature like this should be done with artificial turf, but in many cases, the easier option when it comes to maintenance is a full concrete paver surface. 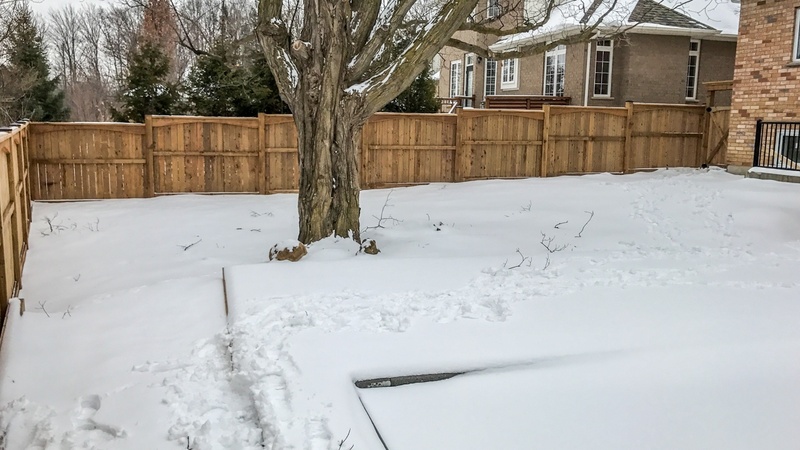 The second issue was the maple tree in the backyard. The year prior, in August, saw 25% of the roots destroyed due to the installation of their pool. The same year in the Spring, a significant pruning was done to the tree (based on recommendations they received). The pruning put significant stress on this tree as a result. The third obstacle was the slope of the yard in the back. The slope meant that features could not be installed easily. This requires patios to need retaining walls, gardens need to be carefully crafted. Slopes are easily the #1 cost factor in most concrete paver projects. The fourth and final issue was the area between the homeowners and their neighbours. Due to the pool installation, this area had been torn up. Water drainage had also been an issue even before this. Now with quite a few obstacles to overcome, we had our work cut out for us. 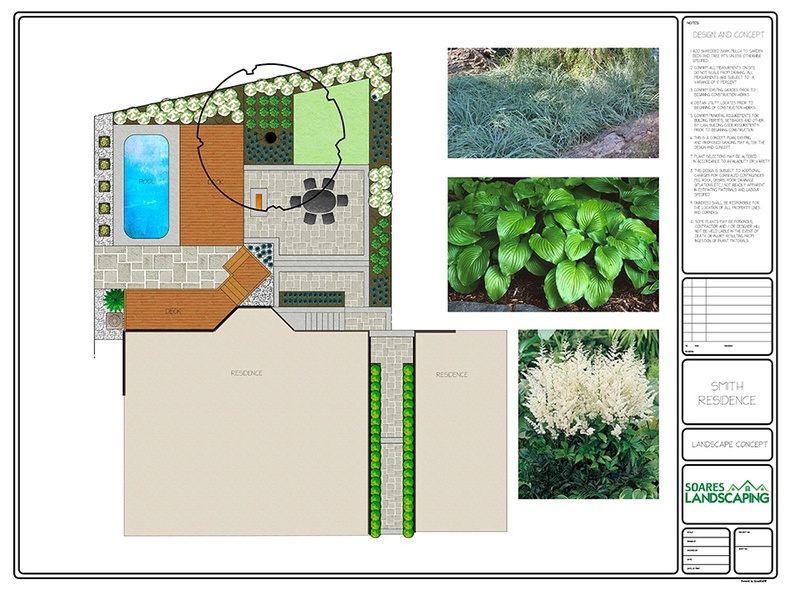 As with most projects this complex, we started with a landscape design. Dimensions of the yard, elevations of the soil, distance to obstructions, were elements all accounted for during the drafting of the initial concepts. Three concept plans were created to give different options when it came to the layout of the yard. Within the concepts, we addressed the modern design with sleek, polished concrete pavers that had already been used by the pool. We also included retaining wall blocks to match (you can see them prominently on the firepit wall). We installed a permeable patio which is a system that allows rainwater to flow through the patio and into the ground beneath it. 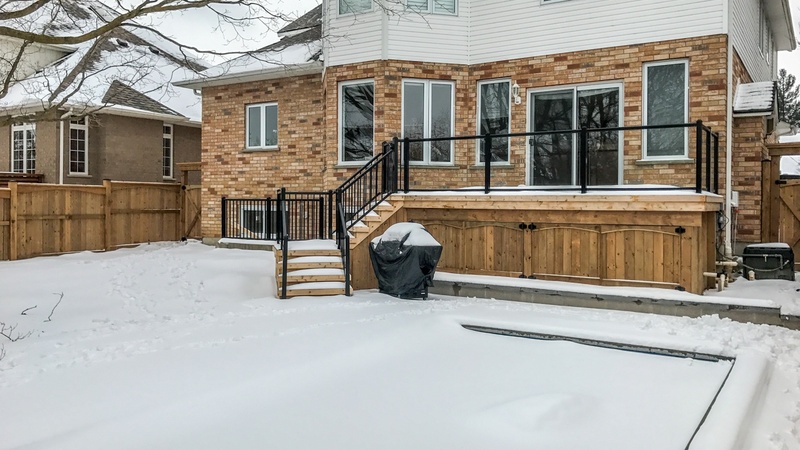 We used retaining walls to gradually step down to different levels of the side walkway between the houses and in the patio to address the sloping yard. We installed a sleek, modern walkway between the homes while also connecting their eavestroughs to an underground pipe to carry water directly to the backyard. 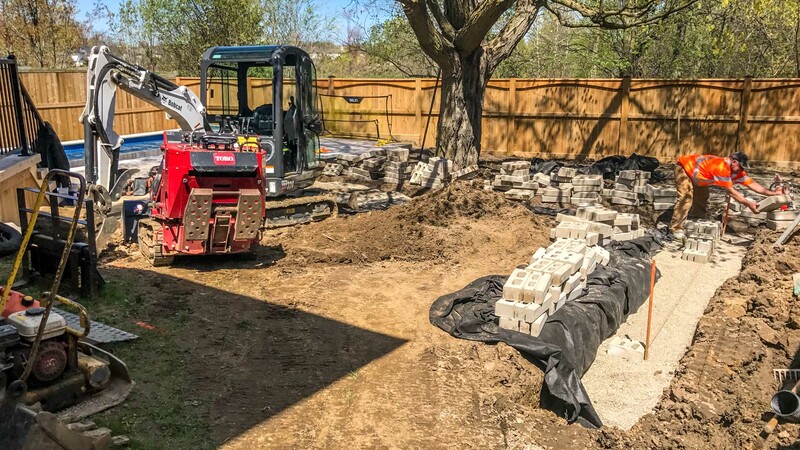 As with every project, there are unique challenges to overcome when trying to accomplish the goals of the homeowner and also ensuring that we comply with building code and best practices for paver installations & maintenance. Our sales & design process ensures that all aspects are covered to ensure longevity for the project. We achieve this by using foresight to work in the best interests of the homeowner. The last thing we want to do is increase future costs due to a poor installation.